I have enjoyed reading your daily journals so much. You have inspired me many times and I have cried as I have read them.[... ]Thanks for sharing with us your adventures along the way. Everyone in Salt Lake is really looking forward to your arrival. However, they have roads and canyons closed so that you can come into town without the traffic. So, they are encouraging people to wait til you get to Hennifer or to see you on the 22nd at "THIS IS THE PLACE " park. I heard yesterday that there are going to be so many people at Hennifer that they might be turning them away outside of town because they won't have a place to park. 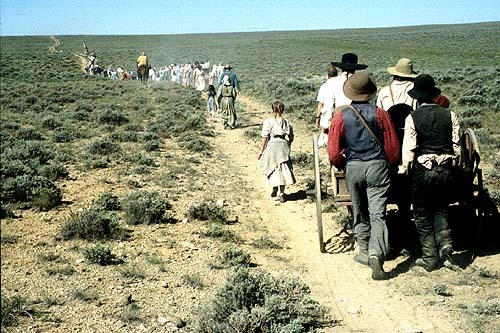 On July 12, Don wrote: I am a professional photographer who took his family for a week on the Mormon Wagon Train in Wyoming. I have about a dozen photos on my web site of the handcarts and wagon train at South Pass, Big Sandy Crossing and Simpson's Hollow. Hi, Thank you, thank you, thank you!!! I have wanted for years to visit the sites of the graves of my early pioneer ancestors and a few years ago was able to take a trip to Utah to do that. One disappointment was that I had no records showing the exact gravesite of Jacob Foutz. Today, while browsing your site, I found that information! 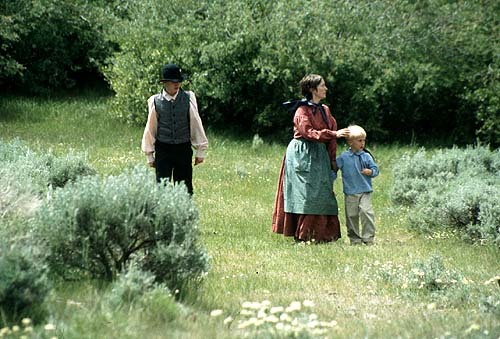 I can't tell you how excited I am, I have contacted the Pioneer Trail State Park and am awaiting a call from their historian to tell me if Jacob's grave is one of the known and marked ones. I hope you will continue to keep the site active even after the trek is over, there is so much information that I have not yet had time to look at, no telling what else I may find out! I have followed this Journal all along from day one. I want to know how things are going, what is happening out on the trail, and all that is interesting to hear about. However, I have concluded that your "Wagon" train consists only of walkers. Every once in a while there is mention of an outrider and that a walker rides in a wagon. Educationally speaking, is this wagon a support vehicle wagon, or is there actually covered wagons in this "Wagon" train? 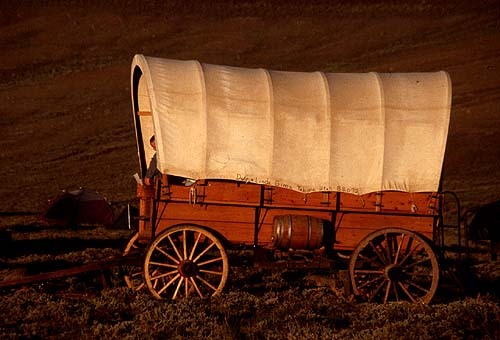 I have yet to read anything about any of the pioneers who drive these "wagons" if there are any. I will be out there this weekend to join the "wagon" train, and come home with my husband, who by the way has been with the "wagon" train the whole distance. I'm not talking just from Council Bluffs, I'm talking from Montrose. I would have liked to been told about these "Wagon" drivers and outriders also. There are some very interesting people there and each has a story that should have been told... I'm very disappointed in the journal entries that have been written, and more so about the many, many stories that haven't been told. I am sure the walkers are very wonderful people, and I give them all the credit they deserve for walking the distance in all the conditions they had to endure. My sincere prayers are with them all. There are others there also, and they deserve all the credit too for doing what they needed (wanted) to do. I believe the world would have enjoyed meeting them too. By the way, tell Russ Leger "Hello" for me. You did recognize him every once in a while. I know Russ as we rode across Iowa last year together along with the other Ox Bow Company people. WHERE ARE THEIR STORIES? Margaret, I will look you up when I get there. I do want to meet you and introduce you to my husband and the other marvolous people you have missed these past 3 months. See you Saturday or Sunday. On July 16, Renee Gardner of Ogden, Utah wrote to thank those responsible for producing the web page and to encourage Margaret to write a book. I wholeheartedly agree. I saw the train in Guernsey, WY and shortly after, found and started reading the journal entries on the web site. Margaret's writings, especially, have touched my heart in such a way that it is difficult to describe. Her descriptions of events and the joys and pain of them, along with her vivid accounts of the land being crossed, have made me more aware of what it must have been like for those who went before. 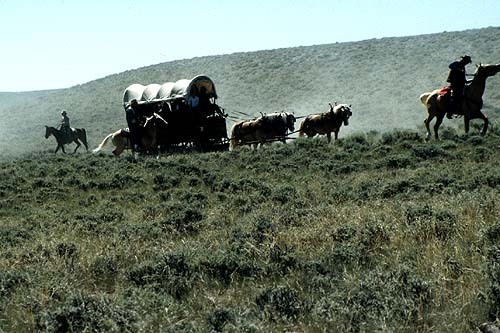 As a member of the Oregon-California Trails Association (OCTA) for a number of years, and some 25 odd years before that studying 19th century American West history, the sense of what it must have really been like to travel west under the difficult conditions just did not hit home like it has through Margaret's journal postings. It seems to be such a difficult thing to go through now, and I am struck by the thought that Margaret and all the rest are free to walk away from it all and go back to their 1997 world; those who came before could not...they had no realistic place to go back to...the trail beyond was truly an unknown - never having been seen by them. What courage it must have taken then, and I dare say that for the ones out there now, it is a remarkable and courageous undertaking. I salute all who have participated in this re-enactment. As for Margaret, it would be an honor to meet her someday. If she reads this, I implore you, Margaret, please do not deny a book you would write to those of us who have gained so much from reading of your experiences. We would gain so much more through a book, and of course, for your family and descendants, and that of the church's history, it would be such a wonderful thing. You have such a way with words. Please write it for us - for those who could not go on the journey except through your writings. And I hope that at the top of Immigrant Canyon you will be the one to push one of the handcarts over the edge - as a wonderful symbol of fortitude, courage, dignity, and dreams for the future, as well as in honor of the lady in 1847 who did the same. In a way, I hope that this (if it is done) is kind of private among those of you who have gone all the way - the spectators would maybe be in violation of a kind of special ceremony. Hi guys! First I want to say that I have enjoyed reading about this re-enactment daily. Thank you for all your hard work keeping us in touch. What has happened to the Sekiguchi family though? I hope all is well with them. Just wondering. It was funny to hear of the Big Fish that got away. Sure... some fish story huh?? Might I suggest that the person driving the fish, decided later that is that it is not really worth keeping. It would certainly be a souvenir that would cost more to up-keep than it was worth when they got it! (Souvenirs are suppose to be low maintenance things right?) A T-shirt makes much better sense. Three... Two.... One... YOU'RE NEARLY DONE! PS. Have a great (back to reality) life EVERYONE! You have made this a wonderful experience for all of us who were not along the way. This is to all of you "Behind the Scenes" people. (I don't know who you are but... YOU know who you are!) There has obviously been months and months and months and MONTHS of time put into this project, whether it be at a computer terminal somewhere down in Southern Utah dealing with all the cyber-ins and outs, OR whether it be along the trail hauling big blue porta-potties around! I just think and wonder, what is worse? Wading through the mounds and mounds of red tape rolling out like royal carpet in front of you, OR walking or driving a team or driving a vehicle along through the dust, rain, cold, heat, and mosquitos for the last 3-4 months. Since some of you have done both, well, what CAN I say, you are an amazing troop! To one (and more) like myself, IT WAS WORTH IT!!! IT WAS EXCITING, FUN AND GREAT! Have a great (real) life, (now). This is Julie signing off from a computer, in a room, in a house, in a city, somewhere in Texas. In July, Chad wrote: Margeret: if this ever gets to you Joann and I want you and Art and your children and all the walkers to know that our thoughts and prayers are with you, and that we continue to think about you and the trials and the trains and the trails often each day. Dear Margaret Thank you so much for your thoughts on the train. I'm Jerri Johnson with Dutch Oven Delight - dinners through Wyoming. I know it wasn't funny then but as I read about the day of missing lunches I recalled it also. We didn't know anything about it until that night as Alice and Clyde would take the lunches to you. Out truck wasn't off road friendly. (At Willow Springs after the rain I figured we'd just become permanent fixtures there. We weren't able to leave until after 12 and were hoping we'd beat you to the next camp spot and be able to set up and fix dinner before you got there. In fact - diversion - as you guys would pull out of camp and take the porta potties with you we would wave in desperation, knowing we now had to fend for ourselves. That day "the urge" hit and there was not a place in sight. I noticed that the campers had lots of potential and went "tracting". After knocking on the third door and getting no response I just did a Goldilocks things and went in. I was sure they wouldn't mind. I did the leave the lid up as I noticed it was the home of a bunch of men and that's the way I found it. Back from diversion. We fixed over 200 Kaiser sandwiches that day, packed them in boxes and handed them over to Clyde and Alice. Clyde really "gently" called me on the fact that they were 50 sandwiches short (just the amount that would have been in one box). It's still a mystery to me, along with who fired the shot heard round the world, what happened to them. Sorry. Clyde bought some from Little America to make up for the loss. Quite a guy. He always was looking out for youse guys. Anyway, thank you for sharing the time with us. I regret that we were so busy with meals we didn't get to mix with the train as we would have liked to. Earl kept us up on things and introduced us but getting up at 3 am, fixing meals by the light of the Blazer, packing up, calling in supplies and waiting for them to arrive, unpacking, and fixing food kept us all way busier than we had ever anticipated. While I didn't have the kind of spiritual person to person experiences you did, I was always amazed that we had enough food (fishes and loaves testimony) and that when our beastly truck broke down time after time we were someplace that it could be taken care of. The Lord loves us. Jerri Johnson and the Dutch Oven Delight Crew. Glad no one was hurt too badly. Accidents do happen and for this long endeavor you and all participants did a wonderful job with safety. CONGRATULATIONS ON THE TREK!!!! Sorry I could only meet up with you at Ft. Laramie. You did an outstanding job in organization and execution. Besides the bonus you gave the LDS you also improved the outlook to Living History one thousand fold. It is an honor to have met you and witnessed this grand program. One again: WELL DONE! After following the trek from the beginning, I just couldn't let the modern pioneers enter the valley without following you. What luck! Within four hours of landing in Guatemala City I found a kindly webmaster in the Office of the Archbishop of Guatemala. Of course, I had to share the site with my new WWW friends. They loved hearing about the reenactment and the possibilities for education. This office is using the WWW to share with the world the personal accounts of Guatemalans who were tortured during the war. What a wonderful, small and marvellous world on the internet. Greetings to my buddies...Kathy, Maggie, and Tracy. Congratulations for enduring to the end...celebrate. Kathy responds: I made the journey from Cedar City and my computer to SLC to cheer the pioneers as they entered the valley. Margaret threw her arms around my neck and with relief in her voice said, 'Oh it was soo hard, it was soo hard.' Amy and BC strode in together pulling a handcart. Osamu and his family walked in behind their wagon, relieved to make it. 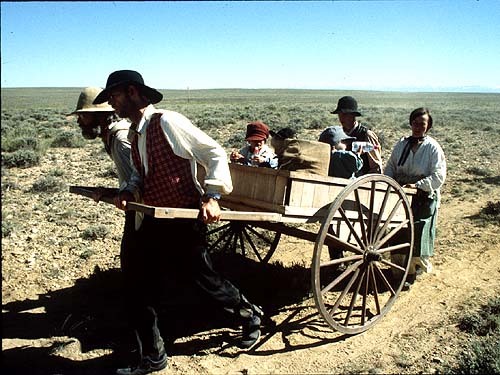 Bre Cornell looked like she was in pain riding in the wagon but she had a smile as wide as Utah. In the crowd, I missed Wendy and Danny, but as the pioneers trekked past, I recoginzed so many of the people that have become so much a part of our lives. What a joy. I heard estimates that over 50,000 were there. 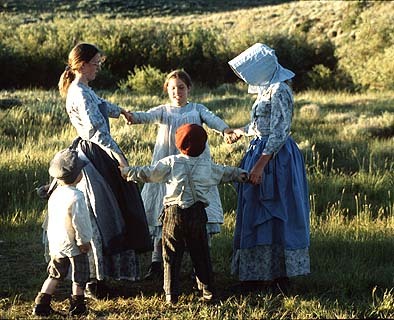 Many of the pioneers had tears in their eyes as they covered those last few yards. It was a wonderful experience. Over the next few days, we'll begin the job of reorganizing the site. Thank so much for such a wonderful experience - and for all that you have done for the site! I have read with interest the ongoing saga of Amy and BC. Can anyone share with us the origin of the button story and the accompanying rules??? I hope that in your re-organization of this website, you will leave ALL of the journals available for a few weeks. I did not know about your site until about the middle of June, and I would like to be able to go back to read the earlier journals when the writers have completed today's entries, or have their 're-caps' finished. When the train came into the valley, I was excited about the possibility of having 'our' journalists interviewed, so that I could see them 'in action'. I guess the TV stations were not aware of how well-known they are, or they would have interviewed them instead of some of the others. I'm going to be lost without those journals to begin each day. They even sparked my desire to find out more about the trip my great-grandmother made. I was thrilled when I found all the resources available on Heritage Gateways. I found a journal of Harry McCune, who was traveling on the same train as my ancestor, and now have many incidents to tell my grandchildren of the adventures of that group. (Grandma wasn't any better about keeping a journal than I am.) By her recording the day when she left Liverpool, I also found which ship she had sailed on, etc. Thank you so much!! Thank you for your web efforts,for I have really enjoyed the site. I was on the train from June 1 - 7 and had a great time. My photographs and memories have been reviewed several times, but this was a very important link to keep track of what continued to happen to the people I met. It was a needed connection for me. 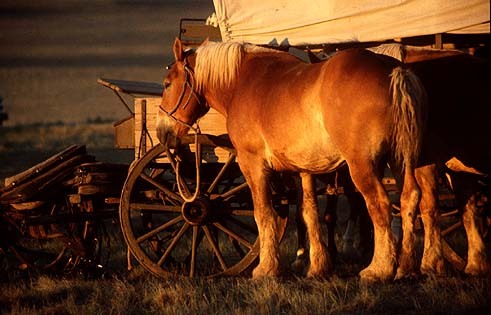 I know the Casper Tribune is going to becoming out with a book on the wagon train. I also read where there was no plan to publish the Internet journals. I was just wandering how long the site was going to have the journals on it? I would like to print off some of my favorites. If you decide to pursue a project on publishing these or require any photos, etc., please do not hesitate to contact me. I would like a copy of the work or add to the contribution if you need anything. You know you might be able to have people donate to publish...I know I would. Thanks again for all of the time and work that went into this site, as I know I am just one of many who found it a daily respite. YOU ALL DID A GREAT JOB.....!! To absolutly everyone involved in both the cybertrek and the real trek Thank you thank you thank you thank you and a million more thank yous to all of you. My wife and I were able to meet the wagontrain at 4 of its camps. We met and talked with many of you and felt of your wonderful spirit. It now brings tears to our eyes whenever we see pictures on the news its wonderful! Thanks to Margeret for her journal entries PLEASE write a book. Please leave this website active for the year se we can remember this feeling. I wanted to take a few minutes and express to you again how grateful I am to the wonderful service you have provided to everyone. I spoke to you in camp on Sunday, when you were camped several miles on the other side of Farson. I expressed my gratitude to you for your willingness to write such spiritual and personal events and place them for all the world to see. I feel more than double that gratitude now that the trek has successfully reached its destination. My husband cooked for the last five days of the trek. I was able to join him on the the final Saturday and Sunday of the trek. [...] Thank you for your wonderful gift in being able to relay the feelings and messages of this wonderful, miraculous event. I have got to express my deepest gratitude to you for the last few months I have been able to share with you. I have can not remember feeling this way , such intense emotions, as I read some of your daily trials and your funny experinces on the trail. I ached to be with you on the journey, but in a way I was. [...] I have become better through my brief association with you on the internet. You will be forever in my best of memories[...]. Words cannot express the gratitude I have for the efforts you put into your journal. I followed along every day. Somedays there wasn't a post and then after 2 or 3 days they would pop up! I have laughed and cried as I have read some of your posts. I have printed some [..] stories for one dear lady friend who does not have access to the internet. When I hand them to her, she is so happy to get them, she holds them next to her heart like it was a treasure and says, "THANK YOU!". You will probably never know how many lives you have touched with your journal. You made us feel as if we were there or as close as we were going to get! Your descriptions of EVERYTHING were just beyond words. What a great writer you are! Welcome back to the real world and THANKS MILLIONS. Thanks so much to all of you who have helped us to enjoy the experience of your trek west. It has been a thrill to read your writings and to visit you along the trail in person. This has certainly been an exciting time for us all. You have really done an outstanding job. May you be blessed as you "adjust" to the rat race of the 1997 world. As of this writing there are no journal pages of your feeling as you entered the valley and your experiences in Salt Lake. There are many who were at the park and watched your parades who were thrilled for your triumphant experiences. Please be sure to "complete" your journey on the Internet for us. It would even be interesting to have an entry about your swing back into the modern world. Thanks again for all the extra time you took to share your experiences. Virginia Starling (with the handcarts) is my sister. What a wonderful example of strength and courage she has been to our family. We are all so proud of her. We so much enjoyed this site, following everything from Day 1--so much so we traveled to SLC so we could cheer when they arrived at the monument. What we need is for everyone uploading journal entries to give us their impressions of July 22nd! I can't believe this was all dropped mid-stream. Now that the reenactment trek is over, our family would like to thank you for a job well done. Our daughter was on the trek all the way from Nebraska, and thanks to your great website, we were able to keep up with the progress of the train. You did a superb job in coordinating everything to make the modern trek relate to the original, and to bring it all home to us out here in the world. This is a open letter to those who have been a part of the 1997 re-enactment, especially those who shared their journals with us. It has been an inspiration to follow your stories [...]. Even though you had some more modern conveniences than the early pioneers, walking across the pioneer trail shows your pioneer spirit. I know the experience will remain with you over your lifetimes. I was not able to be with you, but I followed you via the Internet. [...]. I primarily followed the journals of Margaret Clark and BC (and Amy). It is an inspiration to follow your progress and growth. When you get time, review your journal entries and reflect on the growth you experienced. I would hope that as time goes on you could share more with us. Best of wishes to Margaret as you return home to your family, those who love and support you. Best wishes to BC and Amy as you prepare to be married in the temple. Best wishes to all those who were a part of this great re-enactment, those that participated, those that served, and those the grew, as you all return to your lives. Well I think one of the scariest moments was when I was driving from Casper Wyoming to Independence Rock. I had followed the walkers that day with water and a place to lie down. 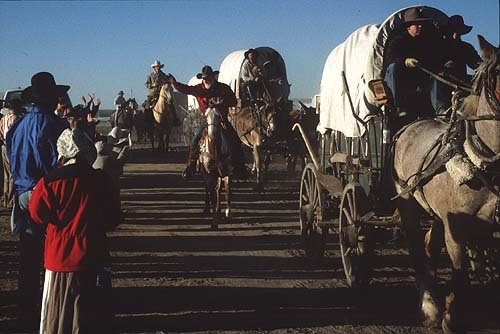 They had no other support that day because the bus was having troubles and the support wagon went with the wagon train. Well I was fully loaded several times, having to send people ahead to the next camp with shuttlers taking support vehicles forward. The water vehicle ran out of water and the bottles I carried came in handy for walkers. I felt very needed that day. I was so happy to be able to offer weary walkers, especially my own a place to fix blisters, rest and not get behind and drink the water I carried. The most special job I had that day and other days when I followed the walkers was to wait at the porta potties each time we passed one and take the walkers who had stopped for a quick break back up to the group. On some days the walkers had so far to travel that they would not even stop for a break. The porta potties would travel ahead of them and stop on the side of the trail. As the walkers passed if you needed to stop you would stop and the rest of the walkers would keep on going. One of my jobs was to wait and when everyone was finished drive them up to their handcart or group that they were walking with. There were some who insisted on walking and said they would catch up. Some were determined not to ride in anything that had an engine. Anyway after a very long day, we headed back to Casper to do some laundry and buy new shoes for Orrin and Rebekah. They had both grown or wore out two pairs of shoes by now. We finally finished the laundry at about 9pm and were heading for Walmart. Praying that we could find shoes quickly, we were blessed and did. We headed out of Casper at about 10:30pm and we headed straight into a storm. I was driving on a very narrow road, it was not like a freeway with light. It was desolate to say the least. I was going along and the lightning was flashing and the thunder was pounding and the rain was pouring down. As I drove I was also looking at a map. The children had fallen asleep quickly after a long walk that day. Dinner was a quick 99 cent Whopper. As I was driving huge semi trucks were passing me, I guess I was to slow for them. When they would pass me the water would shoot up on my windshield and temporarily blind me. I could barely see the road in front of me, with all the rain and darkness. When the lightning would flash it would give me a split second view of my surroundings. I was pulling the trailer and could see a flapping shadow from the lights behind me it was the tarp covering the stuff in the trailer. I was trying to figure in my mind how we were going to sleep in wet sleeping bags. I knew they were getting wet from the flapping that was going on. I couldn't stop and fix the problem either. Well this was quite the scarry moment. As I drove down the road I realized that my original plan of camping at Independence Rock was not going to happen. The weather and my not knowing these roads was going to slow me down. With the added fear of lightning and thunder I was pretty scared. I began praying. Not to much further I saw a sign of a town comming up. I looked on my map it was a half way mark between Casper and Independence Rock. I decided to take the exit when it came and look for someplace to sleep safely until the morning. Well the only thing in this town was a RV park and a small gas/market. I pulled into the RV park. By now the rain had slowed down, but it was very late. I saw lights on in the office and as I drove closer I saw familiar vehicles and trailers. Lots of them. Camp jacks and other were camped here. I knocked on the door and was greeted by a young man. His parents came to the door.. I asked if I could pitch my tent on the grass out in front near the entrance and they said yes. The wife looked out to the truck, and asked me if I would like to sleep in a trailer. They had a couple trailers that they rented out. The price was right $15.00. I drove over to it and went in. YUCK, but what was my choice? I could set up my tent and take a chance of setting it up on an ant hill. I chose to take the children in and gather what dry sleeping bags I could find and crash for the rest of the night. We woke to blue skies and sunshine and the trailer really looked worse. I told the children at least it was dry. It wasn't dirty just very old and run down. We actually had running water and flushing toilets, it was heaven. 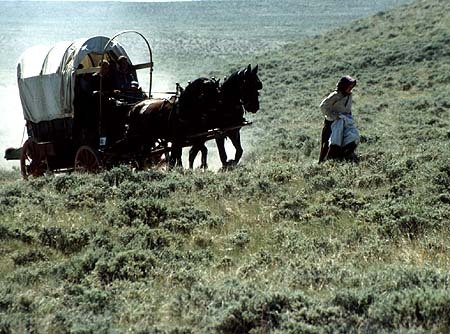 We took showers and caught up with the wagon train and on we went.